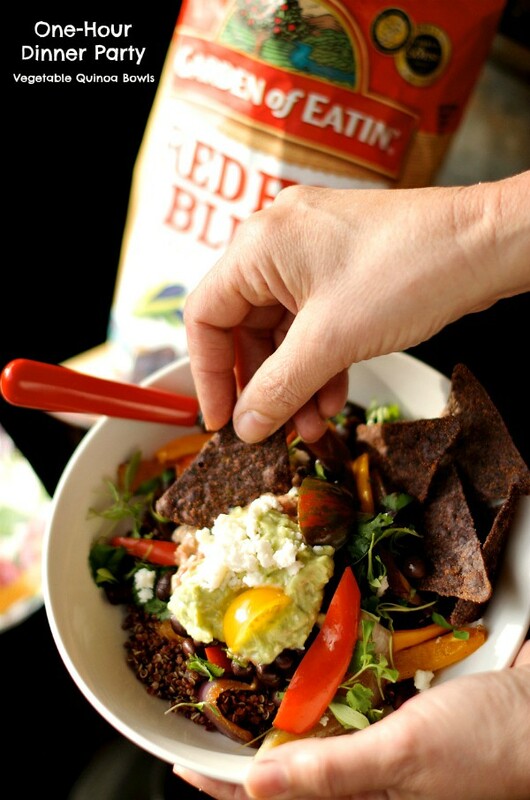 Today I’m sharing a delicious Vegetable Quinoa Bowls recipe, made with Garden of Eatin’® chips, and how to host a one-hour dinner party (sponsored by #ChippedChallenge campaign). When I go to a dinner party, I’m inspired to come home and love, and live more generously, by extending invitations to our home! Let’s say you decide later in the day that you want to host a party (on very short notice)–whether friends just popped into town, or it just seemed like a great idea (a beautiful day), you ran into someone who said, “Let’s get together soon!” Or possibly you forgot that you were hosting (heaven forbid) and have to scramble at the end of the day. Pull it off in one hour. The question is, can you pull it off in ONE HOUR? I’m pretty enthusiastic about last-minute entertaining, but only if I have a plan, and few fall-back recipe ideas. 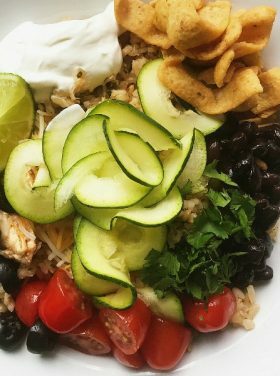 At a recent party where we served Vegetable Quinoa Bowls (with yummy toppings), they were such a hit, they’ve now become one of my go-to, quick and easy meals, which are good enough for company! Here’s my game plan–the menu, last-minute tips and details, so you can throw your own One-Hour Dinner Party! Look through your fridge and pantry and compile a quick and easy menu. Write everything out so you can let your guests know if they should bring anything. Get a head count of who’s coming. Text everyone to make sure they know the game plan (time, what to bring, directions, etc.). Start cooking the food that takes the longest, ie. quinoa or rice, sauté the vegetables, etc. Clear off a buffet area (sideboard, center island, side or folding table), and set out the bowls and utensils. Use paper napkins, unless your cloth napkins are clean and ready. 5. Set a separate area for drinks. What do you want to serve for drinks? A random assortment always works for last-minute parties. Wine, water, what’s in your fridge? And don’t forget the ice! 6. Add a splash of color. 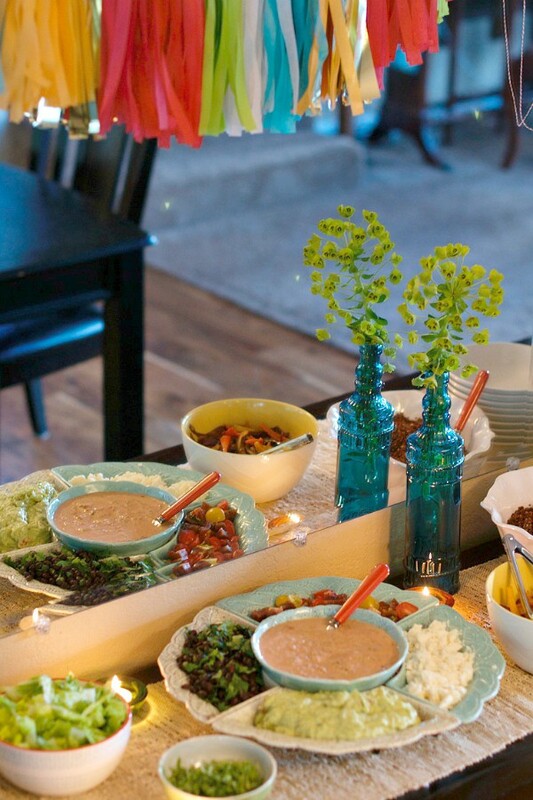 This is a fiesta garland from my friend Abby at Prospect Goods. It’s versatile for any event, and adds a bit of pizzazz. Set out a candle or two on the table—this will make things feel festive and like a “real” occasion without much effort. 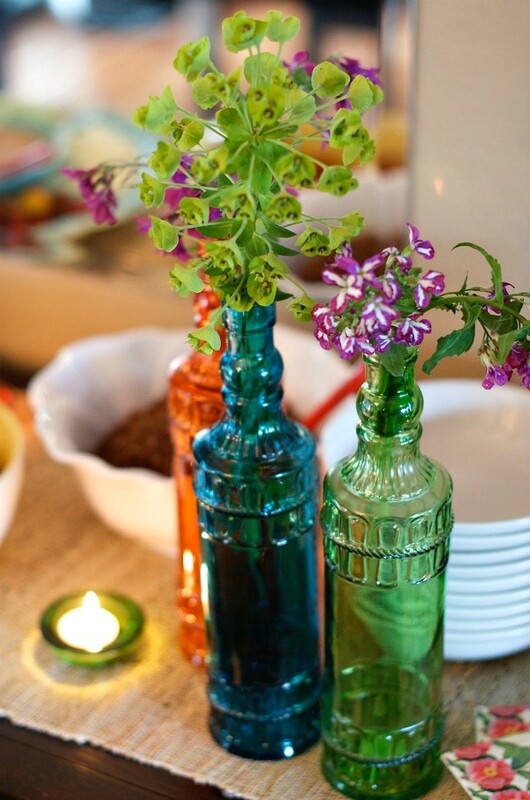 If you don’t have fresh flowers, put a small plant in vibrant colored bottles (from Dollar Store). 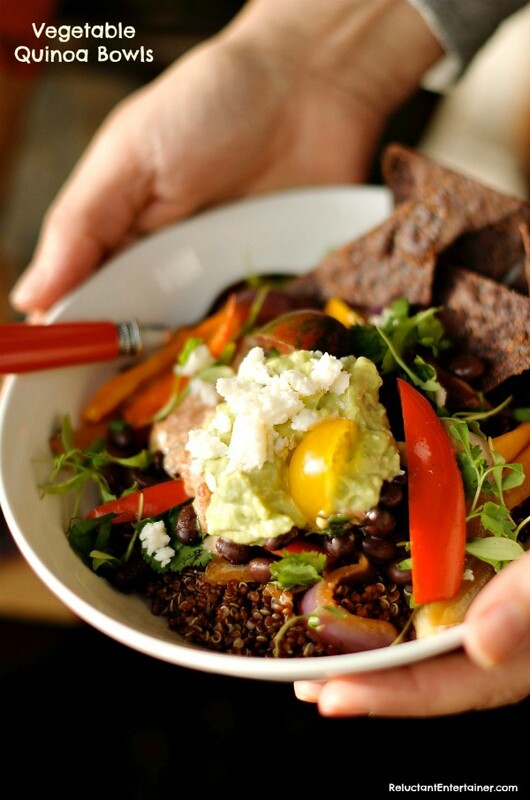 QUINOA: Who doesn’t love a rice or quinoa bowl these days? Get the quinoa cooking either on the stove or in a rice cooker (I use the BROWN RICE setting, with 1 cup of quinoa to 1 1/2 cups of water). DRESSING: I gussied up some salsa and made my own dressing. 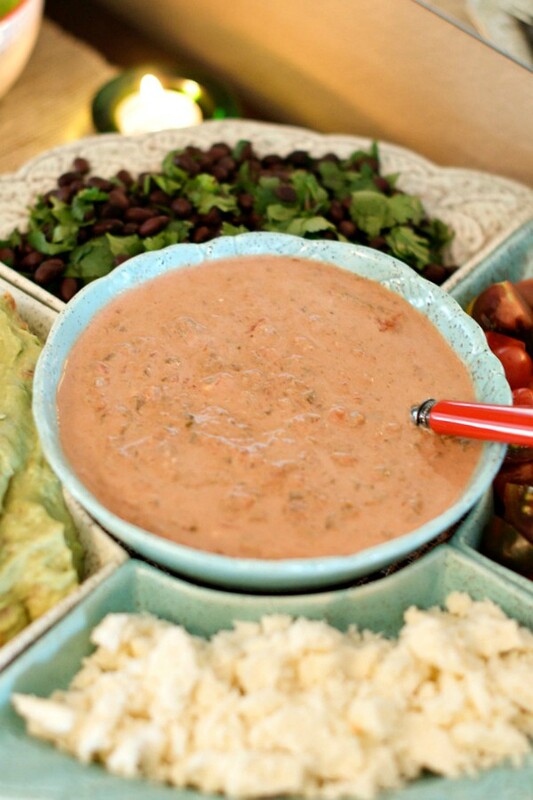 Salsa Dressing: 2 cups of prepared salsa with 1/2 cup of sour cream. Mix well and serve! Our guests loved this. They kept asking about the secret ingredients in the dressing! 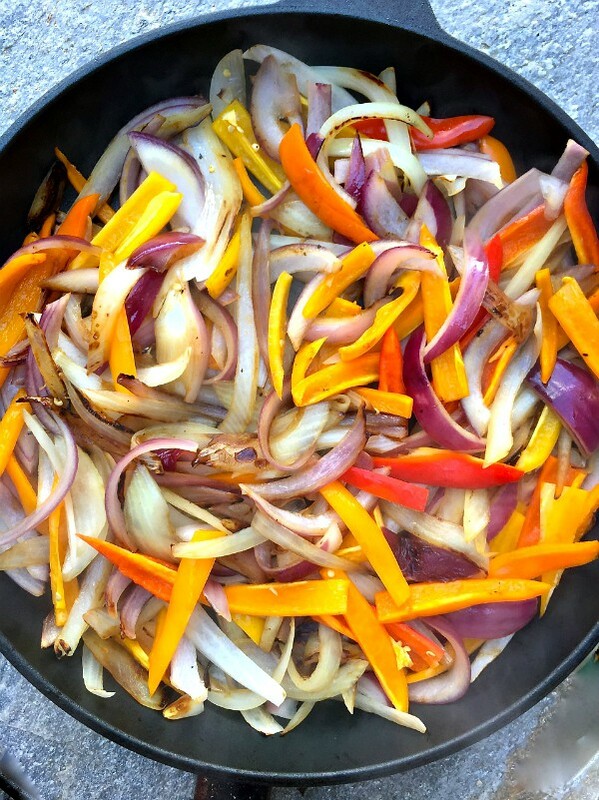 VEGETABLES: Start cooking on low the sweet onions and peppers, sautéing to perfection while not overcooking. Add salt, a sprinkle or two of cumin, and set aside. 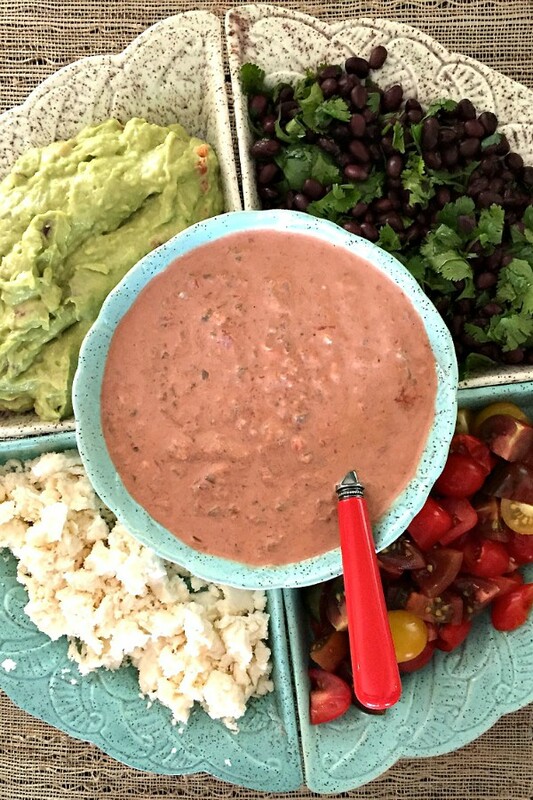 CONDIMENTS: I pulled out a family heirloom, a lazy Susan that my mother had given me years ago, perfect for condiments, such as guacamole (if you have, or just use sour cream), the beans, queso cheese, and fresh tomatoes. Black beans are delicious with fresh-squeezed lime, salt, and fresh cilantro. CHIPS: Quality chips are important. 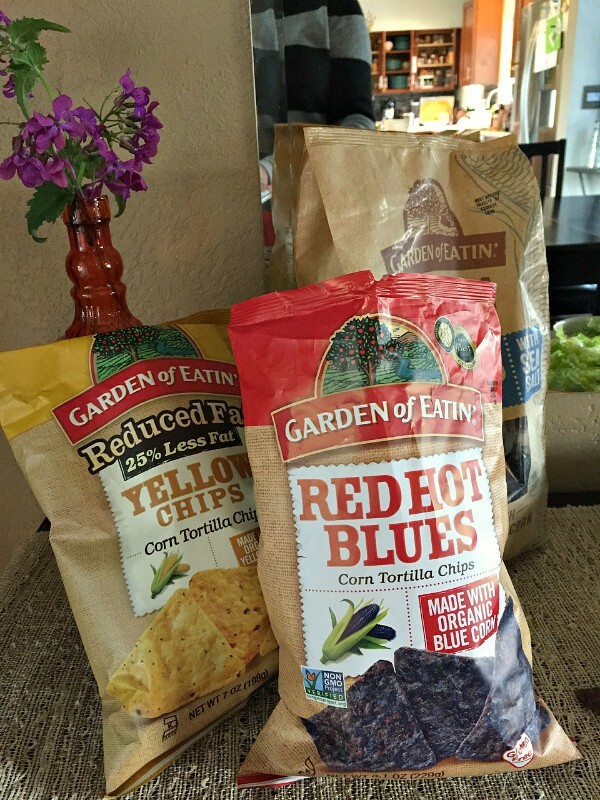 Using Garden of Eatin’®’s Red Hot Blues (made with a tangy touch of cayenne pepper), Reduced Fat Yellow Chips, and Cantina Style Blue Chips with Sea Salt (a thinner, more flaky style) – we all agreed these are the best chips, because they are sturdy and do not break when you dip them. Garden of Eatin’® chips are also made with organic ingredients (whole corn kernels with no hydrogenated oils, artificial flavors, colors, or preservatives), plus they are kosher certified and gluten-free!) Each bite is so deliciously sweet and good! DRINKS: Put beer and wine out on the buffet table if you have time, but really, these can stay in the fridge. People will be happy to help themselves if you tell them where things are. Have the first guest to arrive open bottles of wine and light candles on the table. DESSERT: Raspberry Lemon Cream Galettas are the perfect, simple dessert to serve with this type of meal. Or, any type of sandwich cookie with ice cream (what ice cream do you need to use up in your fridge) makes a delightful treat! A pop of flavor with a cup of coffee is the perfect nightcap (or treat) before you send your guests on their way! Ask for help. Delegation is important for a one-hour dinner party, for items that you may need to complete the meal. You may have most things already stocked in your pantry and fridge, but for items you don’t normally keep, such as queso cheese, or guacamole, or galetta cookies – it’s okay to have your guests stop off at the store and pick up a few items for you! Skip the appetizers. 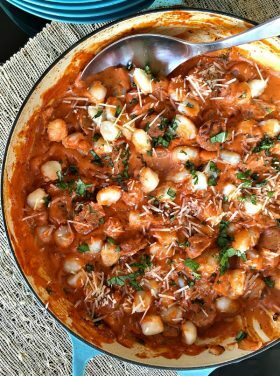 With this type of meal, served with chips and salsa and guacamole–that is the appetizer! For a last-minute dinner party, usually it’s short and sweet. 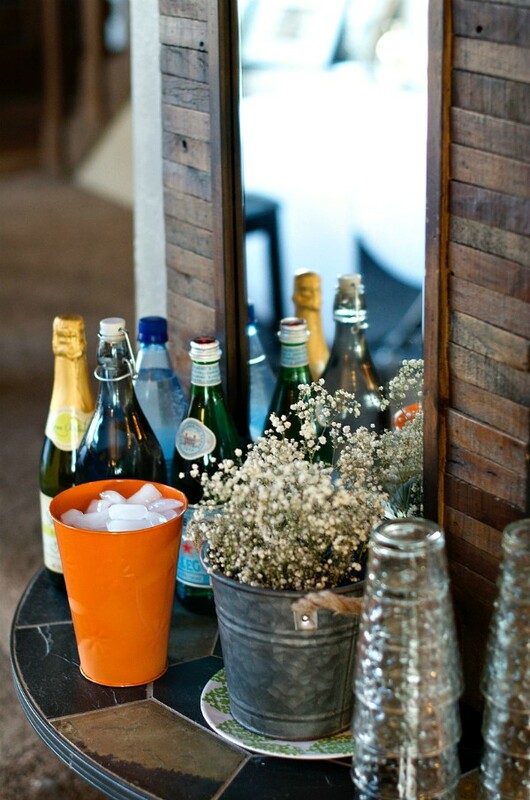 Once the guests walk through the door and are handed a drink, it’s about time to serve the main meal! Mix and match. Everything doesn’t have to match perfectly. Look in the yard for what’s blooming (or just use greenery), and I keep Dollar Store vases, bowls, and napkins on hand for these kind of parties! When the guests arrive, and you’re still putting the finishing touches together, bring them into the kitchen and give them a job! Remember this kind of party is casual! Remember that throwing a party is fun! It’s a nice gift to your friends, but I also like to think of it as a nice gift for me. I always feel refreshed when my guests leave, because I’m a better person at the end of the night than I was before they came. Learning to give, share, listen, pour my life into others always has huge benefits for being a happier person! 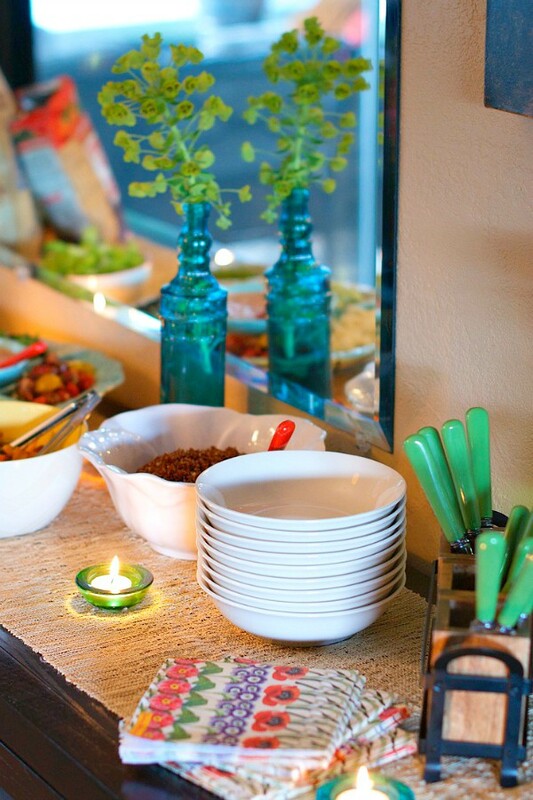 What tips do you have for a last-minute party, and how do you feel about asking for help? Make quinoa on stove top or in rice cooker, according to directions. Heat the oil in a large sauté pan on high, turning down to medium. Add the onions and sauté for 2-3 minutes. Add the peppers and sauté an additional 2-3 minutes. Salt and pepper to taste. 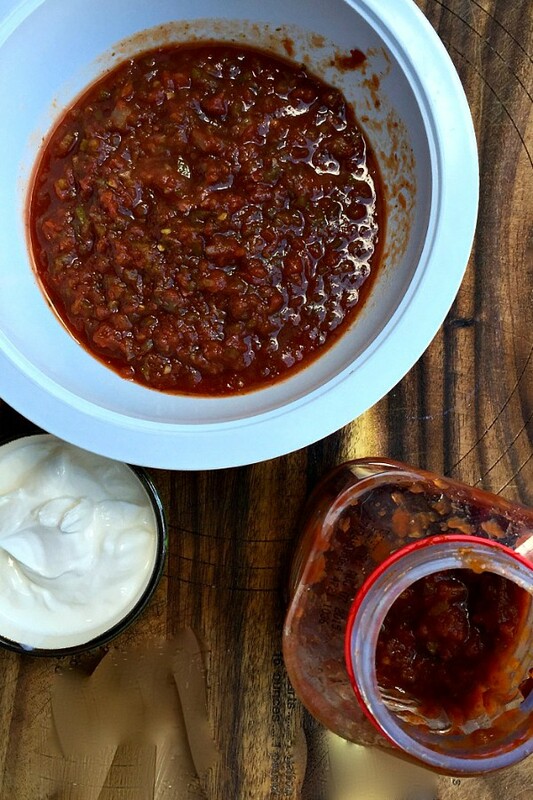 To make the salsa dressing, in a small bowl, add the salsa and sour cream; mix well. In another small bowl, mix the beans with cilantro; lightly salt and add 1/2 fresh-squeezed lime. 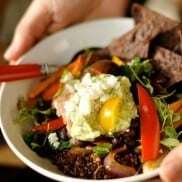 To serve and make individual bowls (servings), add quinoa, onion mixture, salsa dressing, and other toppings as desired. ENJOY! Blue Corn Tortilla Chips – Made from organic blue corn, these chips have a hearty texture. Sweet Potato Corn Tortilla Chips – Made with organic yellow corn and sweet potato, these have a natural sweet potato flavor you can taste in every chip. Kale Tortilla Chips – Real kale and spinach in every chip. Made with organic corn, these chips showcase the kale and spinach in their beautiful green color. Pumpkin Tortilla Chips – Real pepita seeds in every chip. Made with organic corn, these chips are infused with just the right amount of pumpkin for any snack break. This crunchy, crispy, “chipped” post is sponsored by Garden of Eatin’®, the #1 natural and organic tortilla chip brand, part of The Hain Celestial Group, Inc. As always, all opinions are my own! 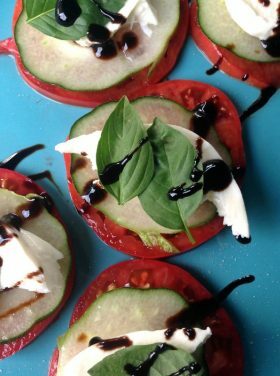 Follow Garden of Eatin’® on Facebook. This is my kind of entertaining, but I must confess that I do the last-minute thing far too seldom. This is such an inspiring post, Sandy! I would totally freak if I only had an hour to pull off a party, but your tips make it seem totally do-able! I have pretty much all of the ingredients for snacks that you listed too, so I could even do those same foods. Thanks for sharing this! You always make entertaining look effortless. And remind me to stop thinking having friends over is an overwhelming proposition. Great idea on the veggie bowls, perfectly chip scoopers. Love the idea of last minute entertaining and these quinoa bowls look the perfect solution. Everything looks perfect, for that matter! Oh wow, these bowls sounds like my kind of meal!! You are a 1 hour party Rock Star! This looks fantastic in every regard and what a fun menu! We love Garden of Eatin chips in our house; the colors, the flavors. They really bring an extra fun touch to your party plan! You are always such an inspiration to entertain more!! I’m hosting a girlfriends/kids brunch in a couple weeks and will be channeling you! Oh I love this idea so much! 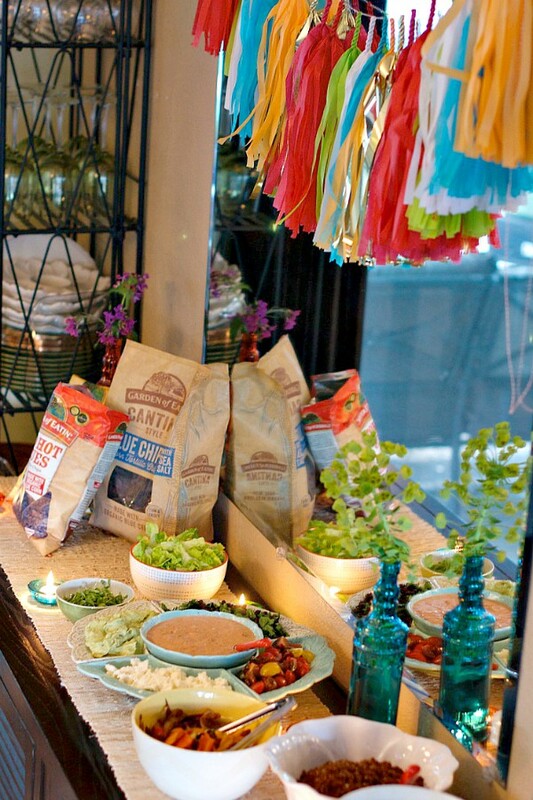 What a beautiful, simple and festive set up for a party Sandy! You really do inspire me. And I have to try that dressing!! Fun!! 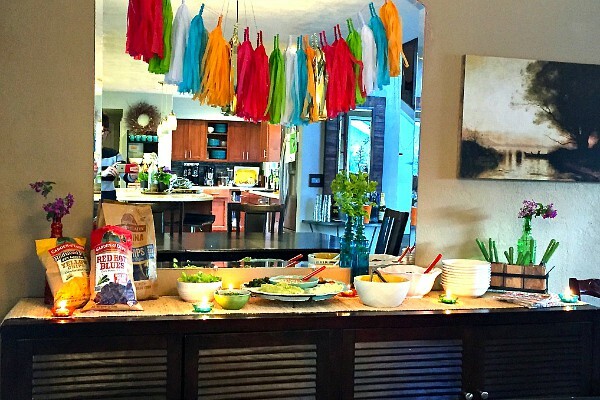 I love this idea, and just got a Mexican paper banner from my mother in law that would be so festive with this party! Sandy, when people ask you what your “secret ingredient” is, do you tell them? Mostly, yes, I do. :) Do you, Erin? I love hosting intimate gatherings. Thanks for the insight & the flavorful recipe! This post is just lovely because it’s so low key and yet beautiful! Do you have a recommendation for a rice cooker? Yes, Jan. I love KitchenAid’s NEW Multi-Cooker. It’s fantastic for cooking so many foods, but I am always using the BROWN RICE setting! Thanks, Kim. Nice and easy, I agree! And yummy!